"You know black people. We don't deal with debt like that. That'd be too much pressure for a black president. Six trillion dollars? He'd be sitting at the White House talking about, 'Hey dog. Tell 'em I ain't got it, man.'" One of the surprise box office hits in 2000, The Original Kings of Comedy drew huge audiences for one simple reason - it's really funny. This Spike Lee documentary incorporates lengthy concert footage from the popular stand-up tour's shows in Charlotte with entertaining backstage scenes. Steve Harvey, D.L. Hughley, Cedric the Entertainer, and Bernie Mac all perform lengthy sets on the wide-ranging aspects of daily life. Many of their topics are simple and have been done before, but almost everything feels fresh and alive with these four comic superstars. Steve Harvey (The Steve Harvey Show) hosts the event and incorporates his unique "country" personality into his brief sets throughout the show. His introduction begins with a silly routine on Charlotte and former football player and criminal Rae Carruth. This varies nicely from the usual concert fluff about the highlights of the city, and immediately draws the crowd into the show. His best sketch of the night concerns Titanic and the possible differences with a black cast. Another funny moment is his interlude about old school music, with various classic past songs incorporated into the sketch. Harvey doesn't draw the biggest laughs, but his personality keeps the show moving in a light and enjoyable manner. The first featured performer is D.L. Hughley (The Hughleys), a fast-talking and original comedian who speaks mostly about the regular aspects of life. He comments hilariously about the intricacies of calling in sick, getting fired, and pumping gas. His words focus often on the many differences between blacks and whites. These observations aren't simple generalizations, and they contain elements of truth that add to their humor. Hughley jumps well from one story to another, and uses his wonderful vocal delivery to emphasize just the right words in each line. Racism is also a major topic of his set, and he incorporates a poignant blend of sad reality and fun into his words. His final improvised moments where he taunts the audience are some of the best moments in the entire film. St. Louisan Cedric the Entertainer (The Steve Harvey Show) is an enjoyable, sharp-dressed comedian with a down-to-earth personality that connects perfectly with the audience. He also tackles the differences between blacks and whites, and speaks on topics ranging from the uses of ushers to the desire for a black president. His facial expressions and physical moments help to emphasize these funny observations about life. One of my favorite moments concerns the ridiculous nicknames of young kids today, including "Little Pistol Starter" and "Delicious." The final act comes from Bernie Mac (Life), the most energetic and roughest of the four stars. He speaks in a crazy, wide-eyed manner that corresponds with the harsh nature of his comedy. Mac is very straightforward, and stresses that he's presenting what we know and won't say. His comedy succeeds because elements of truth exist even in his most outlandish material. His energy and physical moments really draw the audience into the set. While he is my least favorite performer of the four, his act still contains plenty of hilarious moments. Spike Lee directs this film in a fairly simple manner that avoids unnecessary camera movements or techniques. Instead, he lets the four talented performers control the screen, and the camera merely sits back and documents the fun. Some priceless audience shots highlight the energy of the film. While its technical aspects appear to mirror television specials, it rises above them with these small touches from Lee. In fact, The Original Kings of Comedy stands well above the usual crop of theatrical comedies released in recent years. Image Transfer Review: Spike Lee shot The Original Kings of Comedy with digital cameras, so it contains a different look from normal theatrical features. This home video-type of picture creates an intimate feel that brings viewers right into the show. Also, the 1.85:1 widescreen anamorphic transfer is clear and pristine and lacks the defects inherent in many feature films on DVD. The visuals are consistent and fail to detract in any way from the enjoyment of this documentary. Audio Transfer Review: The 5.1-channel Dolby Digital transfer on this disc sparkles with clarity and sharpness, but it doesn't play a major role in the film. Because this documentary focuses on a concert of stand-up comedians, the audio is nearly all dialogue. The sets do utilize music, but it mostly remains in the background to the jokes. However, the transfer does make the words easily decipherable, and no major negatives arise. A 2.0-channel Dolby Surround track also exists, and it only differs slightly from the digital one. Both succeed in presenting the material, but they can do only so much within the limited aspects of the movie. Extras Review: This disc features 26 bonus minutes in seven segments that were deleted from the original feature. This section is a real treat, and it provides numerous moments of hilarity and insight into the stars of the film. The first two scenes have Steve Harvey messing with people in the audience and playing with Spike Lee's automatic camera. The third scene is classic D.L. Hughley as he presents black variations on Indecent Proposal, Alive, and Gilligan's Island. Bernie Mac does a silly improvisation in the next segment when his microphone shorts out. The highlight of this section is the lengthy talks with all four comedians about their early days and influences. It's amazing to realize the effort and time these men spent to reach the peak of the comedy circuit. They all express gratitude towards the work of Richard Pryor, Eddie Murphy, Robin Harris, and Red Foxx for paving the way for their success. Finally, the four guys spend some time just talking and having fun around the card table. It's obvious from these moments that everyone really likes each other, and their friendship is not a stage act. Another extra feature is the dull music video for #1 Stunna by Big Tymers. It contains the usual staples of recent rap videos, including the money, cars, jewelry, and crowds of people. Steve Harvey, D.L. Hughley, and Cedric the Entertainer appear as salesmen in this video, which lacks much originality. It does utilize an excellent full frame transfer with bright colors and a nice 2.0-channel Dolby Surround audio track. The lone other feature is the theatrical trailer, which is presented in an impressive full screen transfer. It showcases some of the funniest moments of the film and depicts each star at his best. 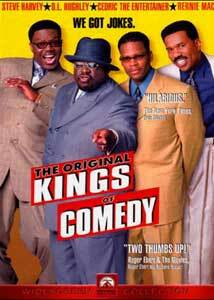 Arguably the funniest film released in 2000, The Original Kings of Comedy showcases four comedic talents in peak form. Each performer deftly uses his own original delivery style to create nearly constant hilarity. Their side-splitting takes on everyday topics are fresh and inventive and stray from the usual stand-up cliches.